A sales and Marketing agency, specialising in clear thinking and direct mail. 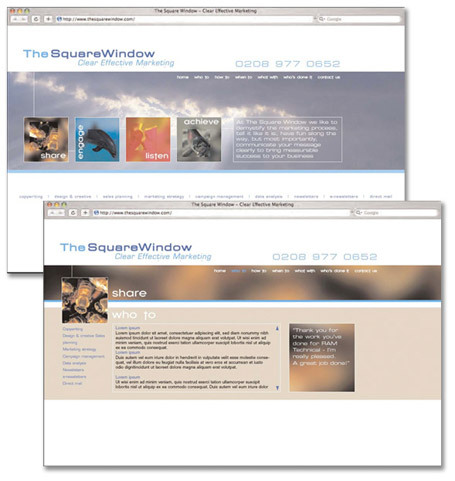 To create a modern and professional looking website, that clearly highlighted the variety and breadth of skill on offer, whilst retaining their brand and extending it. Using the identity we created for them we applied this to the new site. With blocks to represent the windows and a strong use of colour with images to communicate their skills and define differing areas of expertise and thought. We looked to nature to convey a unique approach to sharing, engaging, listening and achievement for their clients; the fascinating dance that bees use to 'talk' to other bees about where to find the best source of food is used to highlight sharing for example. Clean lines match their values and business sensibilities. Strong and clear, it communicates their values and unique skills perfectly, so much so they are now one of our significant partners!